Miss Mochi's Adventures: Happy New Year! Ozoni Recipe! Happy New Year! Ozoni Recipe! Happy New Year everyone! I hope everyone had a good 2012 and will have an even better 2013! My family drove up to my great uncle's house to eat ozoni, mochi soup that is traditionally eaten as the first meal of the new year in Japanese culture. 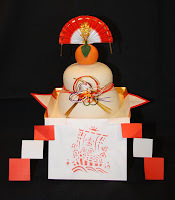 Oshogatsu, as the New Years celebration is called, is the most important holiday of the year in Japanese culture. 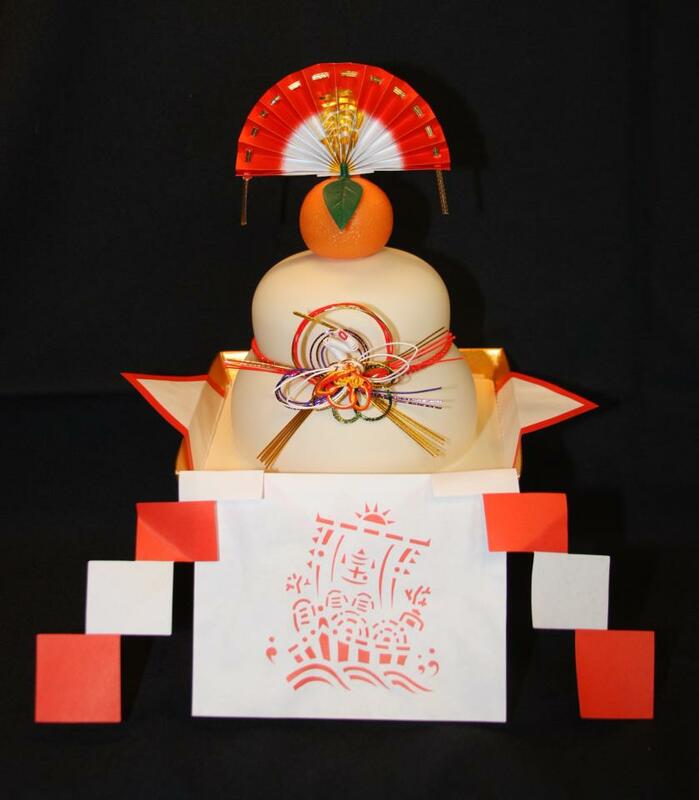 Instead of just celebrating from the 31st to the 1st, Oshogatsu celebrations can extend from December the 28nd to January 6th! My mom got me this kagami mochi for my place! 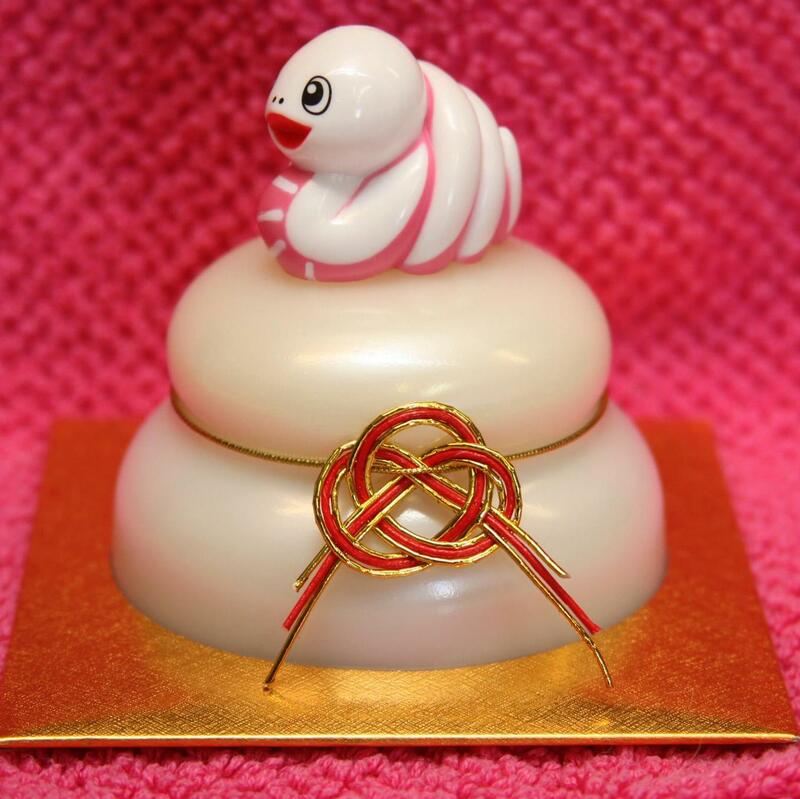 Mochi plays an important part, not only for eating, but also as decoration. Kagami mochi (鏡餅), or mirror mochi, has a place in the household as a good luck charm and a symbol of the coming and going years. The two giant mochi disks are topped traditionally with a daidai tangerine, but as a kid I loved the ones with the zodiac animal on top. 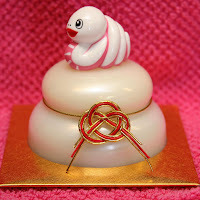 Of course, while displaying mochi is fun and all, it is much more auspicious to eat it in ozoni. 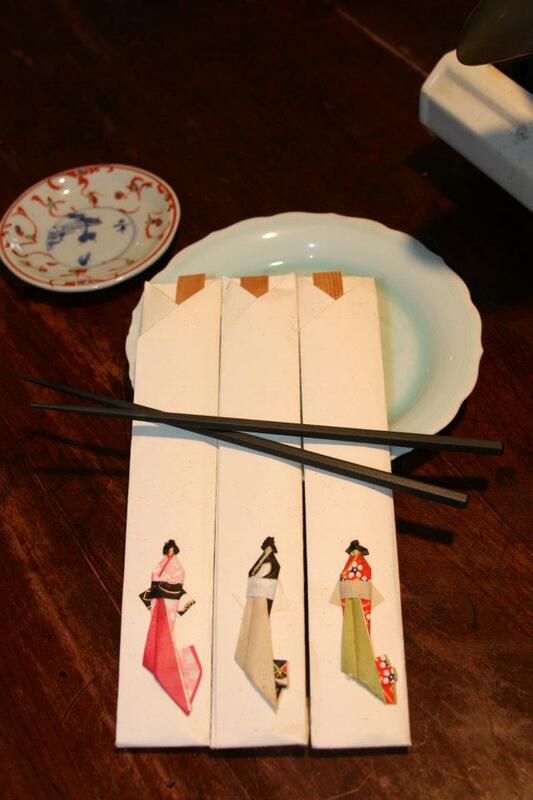 Ozoni (お雑煮), or zoni, has been a New Years tradition since around 1400-1500 A.D. It was originally a samurai battle food, using dried mochi cakes and dry goods that they could carry around with them and then prepare on the field of battle by adding water and whatever fresh greens they could rustle up, then making a stew. Somehow, it became a food of the common man, and later a traditional and lucky meal for Oshogatsu. As a kid, I didn't particularly like ozoni. I remember watching the mochi get put in the broth and thinking what a waste of perfectly good mochi! I preferred my mochi to be sweet rather than savory, and I didn't like all the vegetables interfering with my carbohydrate overload. New hashi for the new year! Now that I'm older, I really love ozoni. The bitter mizuna greens, complex earthy dashi, silky-soft tofu, and sweet mochi, with all their different textures and tastes, are ingredients that are disparate in nature, but come together as just simple and comforting. My great uncle jokes it's great hangover food after a rough New Year's Eve celebration. Ozoni, like oden, is a dish that varies wildly from household to household. Some boil the mochi in the broth, while others toast them before adding them to the soup. In the Tokyo region, they use a dashi based broth, whereas in the Kansai region they use a white miso broth. Coastal regions favor more seafood, while mountainous regions traditionally used more taro. These dishes steeped in tradition, that incorporate your family and upbringing, are my favorite type of food. I used to hate bitter greens, but mizuna is very mild now. 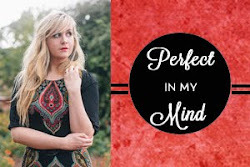 This recipe is very flexible depending on how many people you wish to serve. Just figure on a cup of broth and two mochi for each person, plus more for seconds! Mizuna (水菜) is a Japanese green that you can read more about on its very own Hapa Pantry page. It is a very cold hardy green and grows even in Japan's winter, so that is why it is often used in ozoni. Our family's ozoni is very spartan compared to a lot of other recipes I've seen. I wonder why, but I appreciate the simplicity that allows the individual ingredients to shine through. Mochi toasting, the bowls are ready, and the mizuna is in the pot! Remove the tofu from water, wrap in paper towels, and let drain for 10 minutes. Meanwhile, wash the mizuna, spin or pat dry, and then cut into 2" lengths. Grill the mochi over medium-high heat until browned on both sides. By now the tofu should have drained and cut into 1/2" cubes. 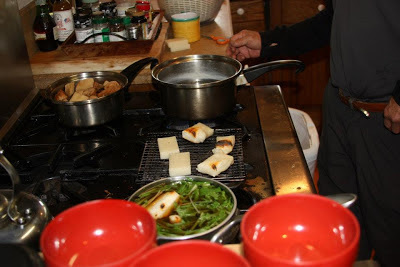 After all the ingredients have been prepped, heat up the dashi over medium heat, and place the mizuna, tofu, and mochi in the pot. Heat at a bare simmer for a couple minutes, until the mizuna has wilted slightly and the tofu is heated through. Place two mochi in each bowl, a good portion of mizuna and tofu, and pour the broth on top. Serve immediately and take small bites of the mochi carefully. Thanks for all the background stories about the kirimochi. My husband and I were walking in a few Japanese supermarkets during that time. We saw tons of amazing looking sets of kirimochi, but not sure what they mean. Now thinking about it, I really should have bought one.